Suriya has touched the magical one million followers mark on popular microblogging site Twitter. This has made the ‘Singam’ and ‘7aum Arivu’ star extremely happy. “Good times, bad times no matter what you guys have always loved me unconditionally..! Can’t thank you enough..!! Love you all..!! 1 M!”, he posted, thanking everyone. 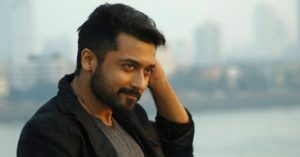 Suriya, who recently had the release of ’24’ directed by Vikram Kumar, is presently shooting for ‘S3’ helmed by Hari, the third installment of ‘Singam’ series. On completing this, he will commence a film to be directed by Pa Ranjith. Suriya and Ranjith were slated to come together much earlier, but the project got delayed after Superstar Rajinikanth picked the director for ‘Kabali’.